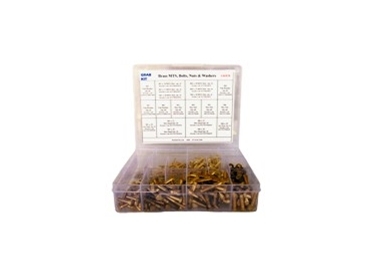 GK018 nyloc nuts kit with ISO as well as fine 1.00, 1.25 and 1.5 ranging from M5 – M16. There are 204 ISO and 60 fine nuts. GK021 high tensile grade 8 UNC / UNF, cadmium plated bolts with nyloc nuts. Sizes range from 1/4" x 3/4" - 7/16" x 1 1/2" in UNC and 1/4" x 3/4" – 5/16" x 1 1/2" in UNF. There are 120 UNC bolts and 70 UNF bolts complete with the nylocs. GK023 mild steel 4.6 metric bolt and nut, zinc plated bolts ranging from M6 x 12 – M16 x 40 in 27 sizes with a total of 189 bolts complete with nuts to match. GK030 Imperial high tensile UNF plain bolts and nuts with sizes ranging from 1/4" x 3/4" – 1/2" x 2". Up to 7/16" is in grade 5 while 1/2" is in grade 8. There are 18 sizes and 150 bolts complete with nuts.